Hydrotherapy means water therapy. Created to treat dogs recovering from a range of injuries and surgeries, our specially designed therapy tub allows dogs to slowly swim against the gentle current created by our jets. This type of low impact exercise is crucial in order to effectively rehabilitate an injured dog. Much like humans, dogs often need physical therapy after surgery or sustaining an injury. Unlike conventional exercise like walking, hydrotherapy places no pressure on painful or fragile healing structures, allowing your dog to heal more efficiently. 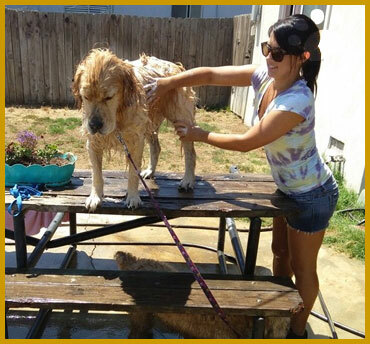 Implementing hydrotherapy into your dogs physical therapy regimen can help shorten rehabilitation time. Did you know that a recent study found that 54% of dogs in the United States are overweight. Although a chunky dog may be cute, the extra weight your dog carries can lead to major health problems if not addressed. 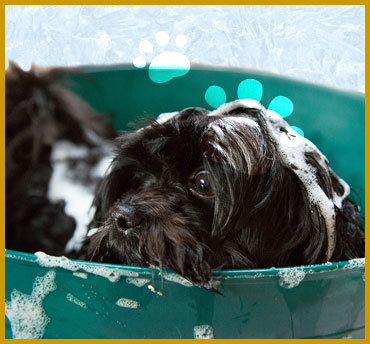 If a healthy diet and walking is not enough, adding hydrotherapy to our dogs exercise routine can be a great way for your dog to shred those extra pounds and gain some Muscle. As our dogs enter their senior years, they often become arthritic, making regular exercise difficult. This inactivity can lead to a slew of health problems. Our temperature controlled tub can help loosen those stiff joints to make exercise more comfortable. How do I get my dog started on a hydrotherapy program? If you think hydrotherapy is right for your dog, talk to your vet to receive a referral slip so we can get your dog on the perfect program. How long does a hydrotherapy session last? Each hydrotherapy sessions lasts about 20 minutes. Your first session may last anywhere from 30-45 minutes due to our consultation at the beginning of your dogs session and the possibility of your dog needing to be acclimated to the new environment. Can I watch the hydrotherapy session? Of course, we'd love for you to be a part of your dogs healing process! However, some dogs can get distracted if their humans are in the room with them during their therapy session so we may ask for you to come back when their session is over. ASK ABOUT OUR HYDROTHERAPY PLAY PASS! !